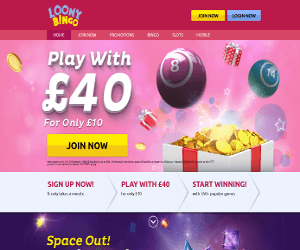 Loony Bingo Promos | Play with £40 + Exclusive Bonus Codes! Get ready to go loco! As Loony Bingo, a wacky bingo site for 2016, has exploded with a bang! Loony Bingo is an outrageously entertaining site from Cassava, and definitely lives up to its insane hype! The design team has pooled their creative talents to provide a slick interface, eye-popping, colourful graphics and unique and crazy features. When you roll into the wacky world, you'll be greeted by an animated collection of crazy-eyed game ball characters with crazy fros, bow-ties and jester hats! Once you sign up and make your first deposit, you can start your Loony adventure with a newbie welcome bonus-blaster. Then you can journey through an insane mix of bingo, live bingo, slots, casino and table and instant gaming hits. If all this unstoppable entertainment isn’t enough, you’ll be spoilt by wacky promotions, wild bonuses and daily jackpot treats! So take a walk on the wild side and prepare for a loony gaming treat! When you dive into the Loony world, you can kick-start your loony adventure with an awesome Welcome Bonus-bundle blaster! After you deposit £10, Loony will top up your account with a £10 bonus, to kick-start your journey with Exclusive Bonus Codes too! Upon deposit, claim your 100% bingo bonus and get £20 worth of bingo tickets. You can then be expected to be blasted by wacky cashback offers from day one. There will also be a stream of quirky daily, weekly and monthly promotions, generous bonus delights and crazy jackpot offers! Some of the top promotions include the daily grand, bingo jackpots, progressive slot jackpots, payday £10K jackpots. You can also avalanche your way to the Self-Made Millionaire £1M jackpot. If you high-roll your way to VIP status, to collect even more at the reels! Loony Bingo is full to the brim with a wacky collection of bitesize bingo adventures! You can sample the delights of crazy 90-ball bingo, loony 80 ball, wild 75-ball and even interactive live bingo gaming rooms, where each bingo room is wackier than the last one. 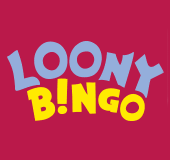 It doesn’t get much loonier, and you’ll also be able to play FREE Bingo to try your luck at winning up to £45,000 in prizes! To spice up the adventure, you can also let your imagination run wild with a slick collection of slot hits, like Fluffy Favourites and Sugar Train, all with generous games bonuses for IG games. Then you can go crazy with adrenaline-rushing Casino tournaments like Blackjack and Roulette. If all that isn’t enough entertainment value, you can then play instant and wild Jackpot-blasting progressive games. If you feel like spending more time in the loony bin, you can also hang with the super cool Loony chat community to track down even more wacky bonus delights, and wild jackpot treats! You can also continue your outrageous journey on the go and access all your favourite mobile games from your smartphone or tablets.